Happy couples often share certain values, traditions, and beliefs. 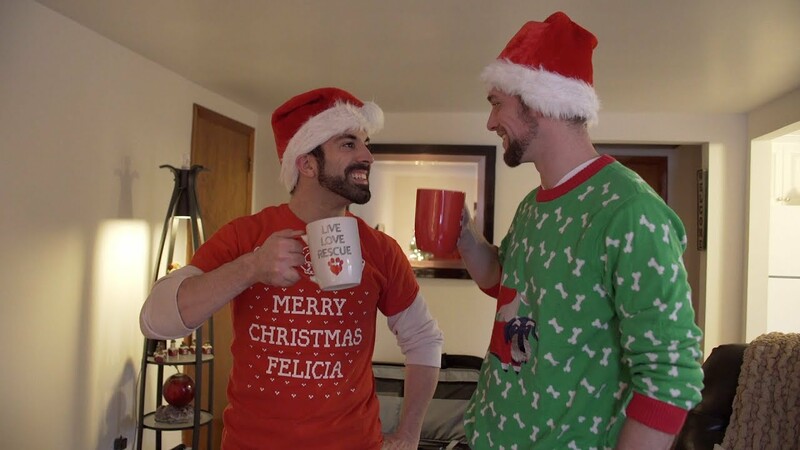 As you can see in this special peek into their first Christmas as an engaged couple, Adam and Jared share a passion for Christmas that's been cultivated and handed down by their respective families. Their traditions are quite different, but the spirit of the holiday has clearly played a big role in each man's life and in his relationship with his family. For Jared, Christmas always meant a massive family party that's "like a Hallmark movie." His aunt leads the family in a singing of The 12 Days of Christmas (no sitting out allowed!). He hangs the handmade ornaments his grandmother gave him. And in this video, you can hear about Adam's first time witnessing the big holiday gathering. In Adam's family, the traditions were a little different, but no less enthusiastic and unique. He recounts, with plenty of laughs, that his father preferred to cut down live trees with the root balls still attached at the bottom; then, after New Years, the family would re-plant the tree on their property. They still have trees there going back 20 years! "Christmas feels so special to me," Adam says. "There's something about the energy associated with the actual day... It's always been by far my favorite holiday." As Adam and Jared were preparing to officially start their lives together by getting married, they planned a big outing to get their tree. And let's just say... it didn't go quite according to plan, though there's still a happy ending. Watch the video for the whole sweet story—and we hope you have a wonderful Christmas!